The racial tensions inside a newly integrated Alexandria, Virginia, high school in 1971 spill over onto the football field, where new head coach Denzel Washington battles resentment on both sides to mold his players into a team...and into friends. Based on a true story, this powerful drama also stars Will Patton as the school's former coach, now Washington's at-first reluctant assistant; with Wood Harris, Ryan Hurst, Donald Faison. Director's cut; 120 min. Widescreen (Enhanced); Soundtracks: English Dolby Digital 5.1, French Dolby Digital 5.1; Subtitles: English (SDH), Spanish, French; audio commentary; featurettes; deleted scenes. Gerry Bertier was one of the best players and leaders on the team known as the best in the history of Virginia football. He was the recipient of many, many awards as well as being heavily recruited by a number of top Universities. However at the end of his senior year’s football season Bertier suffered a devastating injury that left him a paraplegic. 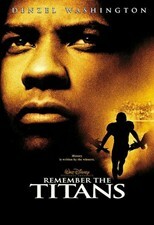 Return from #9 on the list of Best Sports movies to the Top 100 of all time. Return from #9 on the list of Best Sports movies to the Best Sports Movies homepage.